Who is it for? Himalaya Gentle Baby Wipes for Normal Skin is specially designed to cleanse baby’s delicate sensitive skin. It is also an extremely good wet wipe for the facial skin of adults. It is an amazing makeup removing wipe as well. These wipes are packed in a re-sealable plastic pouch. The pouch has an opening at the front to dispense the tissues. The packaging is very simple and hygienic. The wipes inside the pack are kept in stacks of single ply. The wipes are colorant free so they are pure white. They are made of soft cotton fabric. The wetness of these wipes is moderate. They do not ooze out fluid. I would say the wetness is slightly lesser than Johnson’s baby wipes. They do not feel harsh on the skin though. The cleansing solution is light but moisturizing. It has a light floral fragrance. The fragrance feels refreshing. I love the smell. Himalaya baby wipes come in two variants. This particular variant is for normal baby skin type. It is quite moisturizing and rehydrating. I have tried using these wipes as a face freshener as well as my makeup remover. In both ways, it performs well. The gentle cottony texture of these wipes cleans the facial skin from superficial impurities, dirt etc. They are alcohol and colorant free so they do not dry out the skin afterward. It does not have silicones and mineral oils so there is no greasy feel after using these wipes. Just one ply of the wipe is enough to get rid of the full face of makeup. What do I like about this wipes? What I dislike about this wipes? 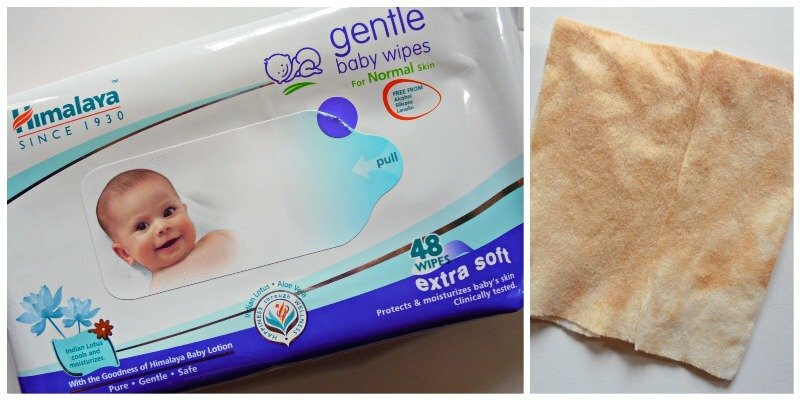 I am loving these sweet-smelling wipes as a face freshener as well as a makeup remover. I am definitely repurchasing these and will suggest to everyone. Kara MakeUp Remover Wipes : Are they Any Good ? Himalaya Herbals Purifying Neem Facial Wipes: Hot or Not ? !